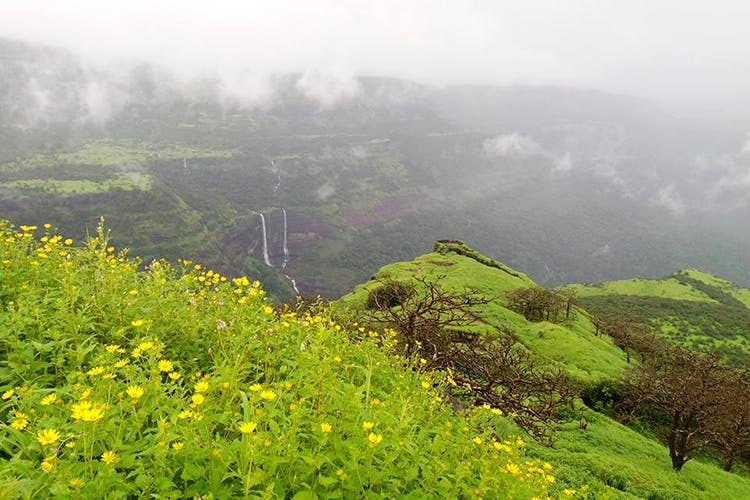 Heading off to Khandala is one of the easiest weekend destinations for Mumbai residents. Of course, Aamir Khan crooning away “Aati kya Khandala” to Rani Mukherjee, did bring this hill station to the public’s attention back in the 90s. We’ve rounded up the top tourist spots that you can explore in the present day. Duke’s Nose is a cliff named after Duke Wellington – shaped like a nose and hence the name. The easily spotted rock structure from a distance is known for its views of the lush ghats of Khandala. You can easily trek up to Duke’s nose, starting from Khandala and walking up the plateau. There’s also a small temple on the top of the hill – Shiv’s temple. It’s a delightful trek and can easily be done by families, group of friends or with your partner. Adding to the many beautiful viewpoints that exist in Khandala, Shooting Point is the best one to go spot to catch an aerial view of the Rajmachi Fort and the lush, green valley beyond the fort. One can see gorgeous waterfalls during the monsoons and the greenery that carpets the ghats. It also makes for a photographer’s haven – as you can capture wonderful landscapes here. In the mood for some historical exploration? Then Rajmachi Fort is our best bet – as it offers beautiful view of the landscapes of the Deccan plateau. Located right at the tip of the Western ghats, Rajmachi comprises of two forts – situated at the Shrivardhan and Manaranjan peaks. From here we can catch the beautiful view of Duke’s nose, Theran and Ulhas river. During the monsoons, a small pool is made at the fort – so if we’re up for a quick dip in the pond – we’re planning on jumping in. Pavana Lake is essentially an artificial lake brought into existence due to the Pavana dam. A picturesque sight, the Pavana Lake, along with the Pavana Dam is for visitors looking to skip the busy town of Khandala and other more popular tourist spots. End the trip with this hilarious cherry on the top – go to Sunil’s Celebrity Wax Museum and pose with the likes Michael Jackson, Kapil Dev, Rajiv Gandhi, Benazir Bhutto, Michael Jackson, Kapil Dev, Adolf Hitler, AR Rahman among other artists – just for kicks really. It’s situated at the old Mumbai-Pune highway, and as the museum suggests – why visit London when we can just drive down to the museum? Book your tickets online here.